British Balloon Command was formed in 1938 under the command of Marshall Sir E Leslie Gossage (1891-1949) to protect cities and other key targets. 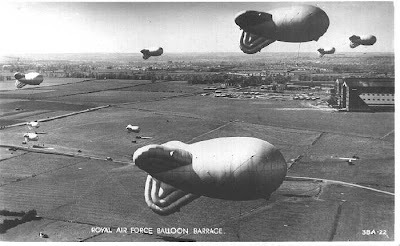 By the summer of 1940 there were 1,400 balloons deployed, a third of them over London. Their purpose was to deter low level bombing attacks at 5,000 ft or under. The intent was to force attackers to go higher where their bombing accuracy was reduced. This also assisted anti-aircraft units which found it difficult to track low level faster moving aircraft. Most balloons were 29ft long and 25ft in diameter and were connected to the ground by a single or series of steel cables. The maximum height of the balloon was 4,925ft the maximum height at which the cable(s) could support their own weight. The principle was that the cable(s) would act like a cheese wire cutting through the wings of aircraft bringing them down.